The Exeter “Twilight” Vintage Bus Evening is a rather unique event. 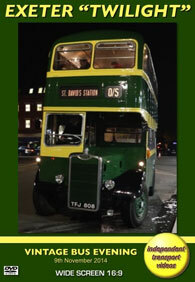 It brings Exeter City Transport, Devon General and other historic buses back to the streets of Exeter after dark! The independent transport videos cameras were on hand to record the event for you to enjoy. The 2014 event took place on Sunday 9th November. This being Remembrance Sunday all donations and programme sale proceeds went to the Royal British Legion. Most buses were adorned with poppies to recognise the fact. Our filming starts on the lower level of Exeter bus and coach station at the beginning of the event in the early afternoon. This is where most of the vehicles were parked prior to taking up their duties. There were some thirteen different routes organised for the vehicles to operate around Exeter. Our cameras started rolling in the main bus station where the crowds of would be passengers were queuing up to enjoy their journeys on the preserved vehicles. Stars of the day had to be the quartet of former Exeter City vehicles in the shape of Leyland Tiger TS8, 66 (EFJ 666), Daimler CVD6, 173 (JFJ 873), Guy Arab IV, 50 (TFJ 808) and Leyland Titan PD2/40, 60 (VFJ 995). Also Devon General AEC Regent V, 513 (CTT 513C), all looking the part in Exeter bus station. Many other ‘local’ fleets were represented including Royal Blue, Western & Southern National and Carmel Coaches to name but a few. Our first ride of the day is on board recently repainted Massey bodied Guy Arab IV, 50 (TFJ 808). This superb sounding vehicle takes us on service ‘B’ to Thornpark Rise and back to the bus station. We continue our filming in the bus station and then go to Sidwell Street in the city centre to capture more action as the sun begins to set. Returning to the bus station we board single decker Daimler CVD6, 173 (JFJ 873) for a “twilight” ride to Pennsylvania arriving there in the dark. We then return to record the busy scenes in the brightly lit bus station. The climax of the event is the running of the four Exeter City vehicles on a tour of the city terminating at Exeter St David's railway station. We film them running along the High Street and then board Guy Arab ‘50’ for the night time ride to the station and back to the bus station thus concluding a most enjoyable event. We must thank the organisers, the drivers and conductors on the day for making it possible. We hope you enjoy our “Twilight” vintage bus evening!